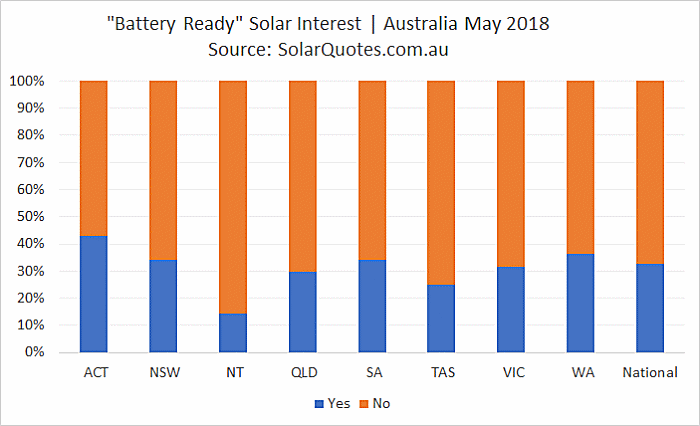 Australians have been installing solar panels at a record rate and there’s still plenty of interest in turning the nation’s naked rooftops into bill-busting electricity generation platforms. Interest in quotes via our service for 6kW solar systems saw a jump last month, from 21% to 24% where a system size was specified. 6kW+ requests also increased, from 16% to 17.5%. However, 5kW is still the most popular capacity at just under 40% (down from 43%). 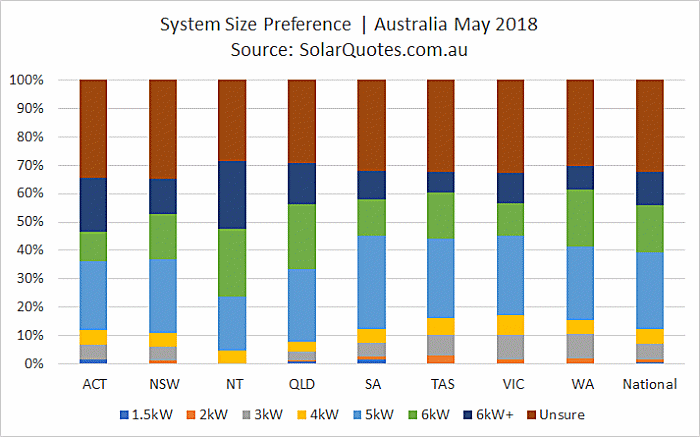 32% of overall quote requests asked for advice on solar power system sizing, down from 39% – so more Australians were clearer on what they wanted in May. 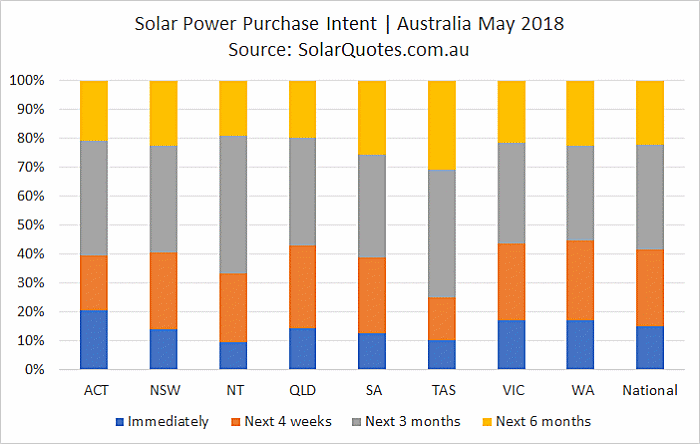 15% of submitters were ready to buy solar panels straight away, down from 17% in April. In relation to a timeframe of anywhere from now to 3 months, the figure was 77%; up from April’s 75%. As usual, not a lot has changed in the price vs. quality stakes, with approximately 78% wanting a quote on a system that was a “a good mix of quality and price”. The “good budget system” option creeped up a little to around 7.5% and “top quality (most expensive)” was again around the 14% mark. Interest in battery-ready systems increased again in April, with close 33% registering this option (April: 29%, March: 14%, February: 12% and January: 11%). This question is asked on our quoting form to assist potential providers in understanding future intentions as this may impact on system design. In May, just over 10% of submitters wanted a quote for a concurrent solar panel + battery system installation. This was nearly twice April’s figure (5.2%). There is an explanation for this aside from it just being a case of battery interest increasing. In May, we removed a flag on the quoting form when solar power + storage is selected providing ballpark price range and offering a battery-ready option instead. This also makes the “battery ready” figures above more interesting. For those wanting batteries and had a size in mind, 40% were wanting a home battery system with 10kWh+ capacity (down from 48% in April). The most requested battery size range was 5 – 10kWh (~45%). 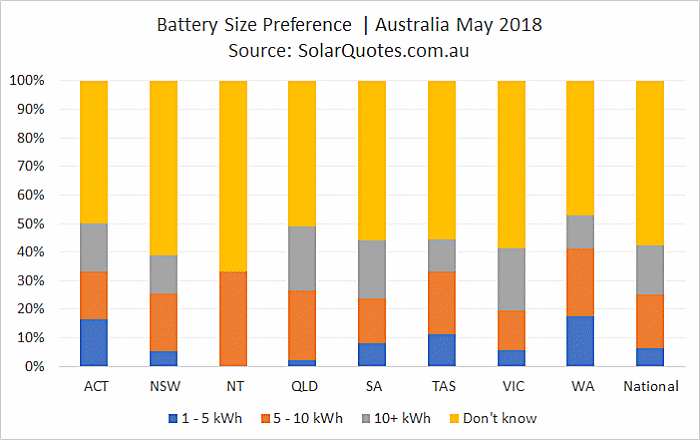 The proportion of those requesting advice on battery storage capacity grew from 48% in April to 57% in May. 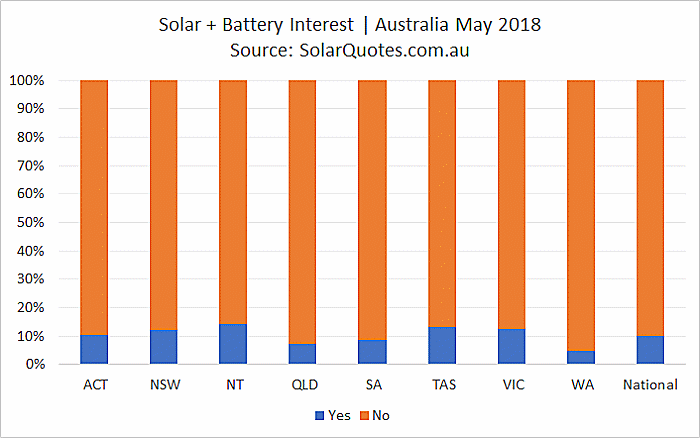 The changes in figures probably reflects the changes to the quoting process described above in relation to batteries, i.e more people expressing an interest but who aren’t particularly familiar with home energy storage (or the costs involved). 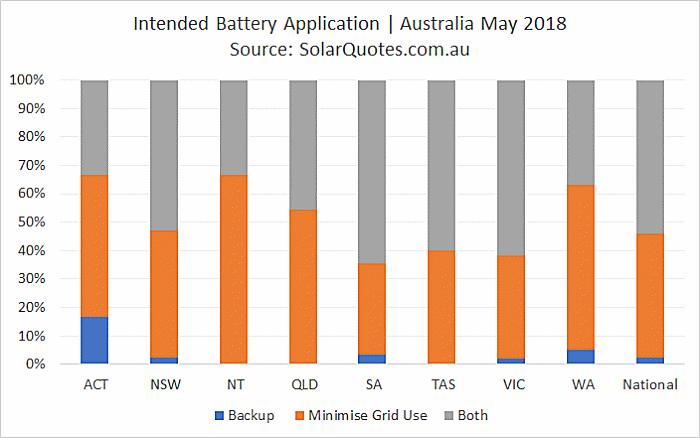 Just 2% wanted to install a battery primarily for backup purposes (4% in April, 2% in March, 5% in February and 4% in January), close to 44% for minimising grid electricity use (no change since April) and nearly 54% for both applications (53% in April). Approximately 45% reported quarterly electricity bills of $500 – $1,000, a figure that has remained reasonably static this year. As in March and April, around 12% said they had quarterly bills of $1,000 or greater. 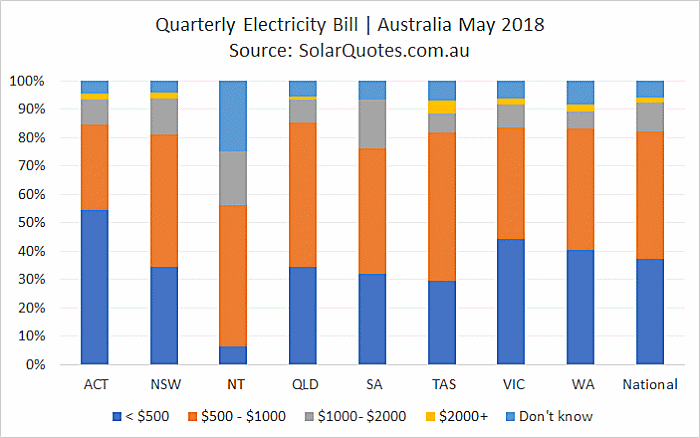 Approximately 6% weren’t sure what they paid per quarter on average, less than in April, March and February (all around 7%); so it seems more Australians may be taking greater notice of what they are shelling out to electricity companies. 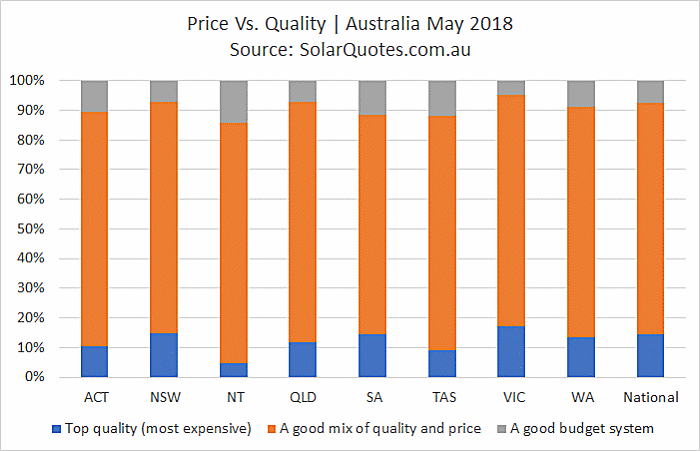 The figures in SQ’s auSSII reports are based on the thousands of requests for solar quotes received via this web site each month. 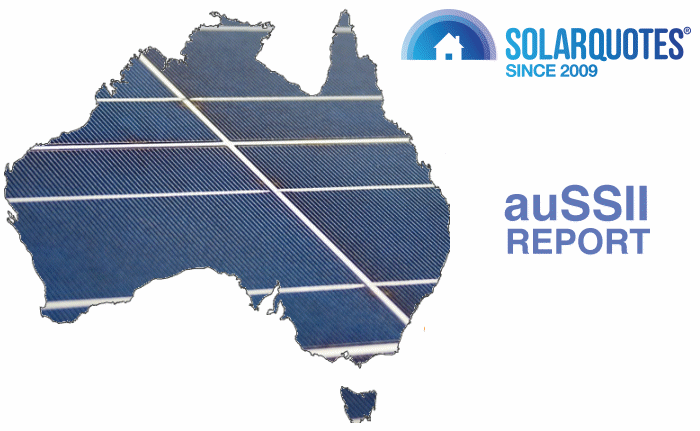 If you’re keen going solar with a trusted installer, you can submit your details and get up to three no-obligation quotes from pre-vetted Australian professionals who are part of the Solar Quotes network, service your area and match your requirements. 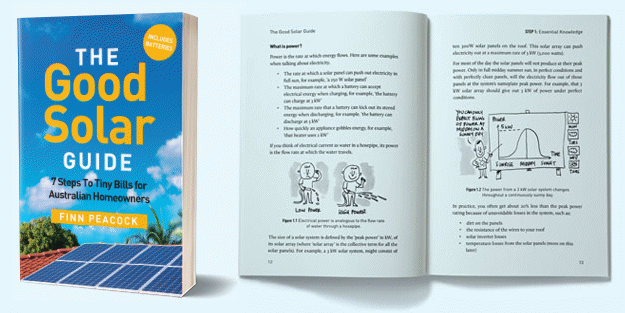 Looking for quality solar sales leads? We’re always looking for quality companies to work with and have been providing superior lead generation services since 2009. Learn more about our solar sales lead generation services. Reproduction of graphs and other detail from any auSSII report is welcome, but you must acknowledge the page from which any data or graphs you reproduce is used.